A gloriously filthy combination of Muppets, Raymond Chandler, and The Naked Gun. Made for grown-up Muppet fans looking for one last laugh this summer. Those shocked Brian Henson, son of Jim Henson, directed The Happytime Murders seem to forget the Muppets have always had an adult edge. Growing up in the ’80s I always preferred the Muppets — or Looney Tunes — to anything on the Disney channel. But here we are with a hard R rating and enough language to make a sailor blush. While it may rely heavily on shock and awe, it’s exactly the kind of film I am happy to watch. After 10 years in development, Happytime is finally here! Just keep your expectations in check. In a world where puppets coexist with humans, Phil Phillips (puppeteered and voiced by Bill Barretta) is a disgraced ex-cop working as a gumshoe in Los Angeles. His newest client, Sandra (puppeteered and voiced by Dorien Davies), has come calling asking for Phil to find out who is trying to blackmail her. Meanwhile, cast members of an ’80s television show, The Happytime Gang, are being picked off one-by-one and Phil must join forces with his ex-partner, Detective Connie Edwards (Melissa McCarthy) to solve the case. 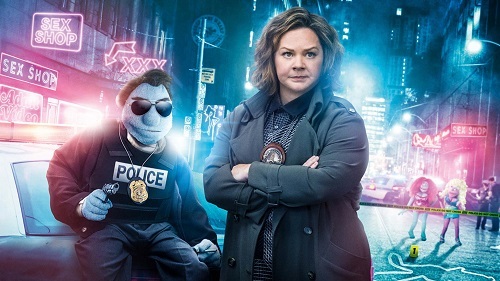 The best way to know if you’re going to enjoy The Happytime Murders is to watch the red band trailer. Full of gross-out humor, hilarious one-liners, and did-I-just-see-that sight gags, Henson never pulls his punches. He also treats his puppet characters as just that, characters. He gives them the same respect his father always did. You believe you’re watching actual characters and not just a bunch of felt sewn together with a hand up its rear. Just about the only thing that could have helped might have been some consulting from Jason Segel. The man does have two Muppets films under his belt and I’m still waiting for him to make a fill film-adaptation of his Forgetting Sarah Marshall Dracula musical. The Happytime Murders is obviously not for everyone. And it’s absolutely not for kids! There were even times where it felt like I was the only one laughing — I tlove all things Muppets. Except The Dark Crystal, but I’m willing to try! As for The Happytime Murders, just expect a gloriously filthy combination of Muppets, Raymond Chandler, and The Naked Gun and you’ll have plenty of fun.